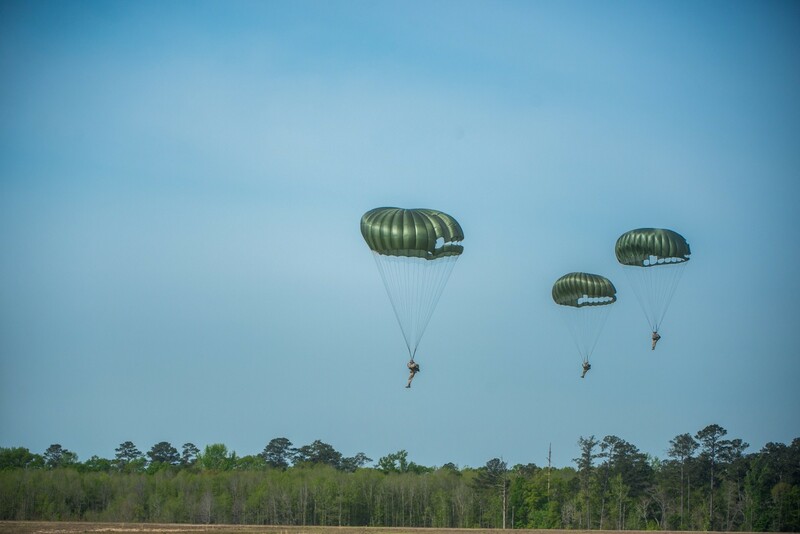 FORT BENNING, Ga. -- Fort Benning, birthplace of America's Airborne, hosted an annual gathering of former paratroopers April 4 through 6, with events that included a parachute jump from a World War II transport plane, a wreath-laying, and a chance to see the nation's newest paratroopers graduate jump school. About 60 Airborne veterans and family members came to Fort Benning for the annual Airborne Awards Festival, which was sponsored by the Atlanta All-Airborne Association, formerly known as the Donald D. Lassen Chapter, 82nd Airborne Division Association. The Association is a veterans group whose membership is open to paratroopers regardless of where they live or what Airborne units they served with, said its chairman, Al Fracker, a retired Army colonel. 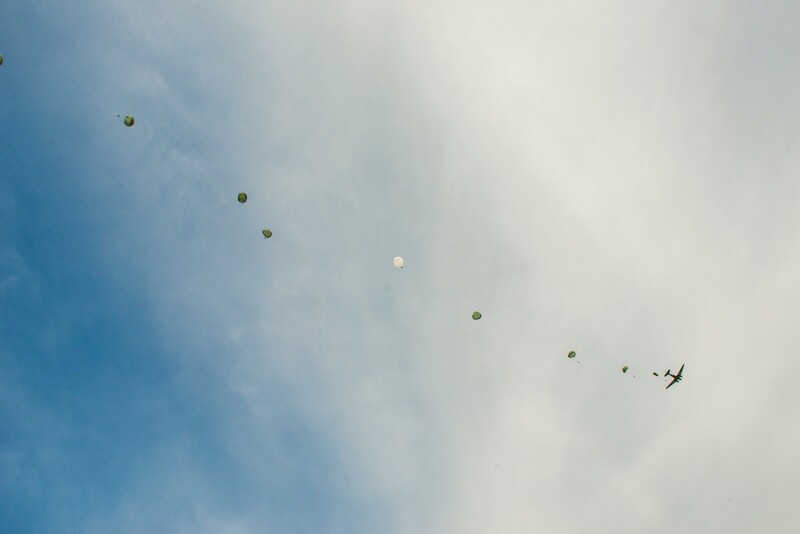 The aim of the Festival was to give paratroopers a chance to savor the camaraderie and fraternal ties of the Airborne community, organizers said. 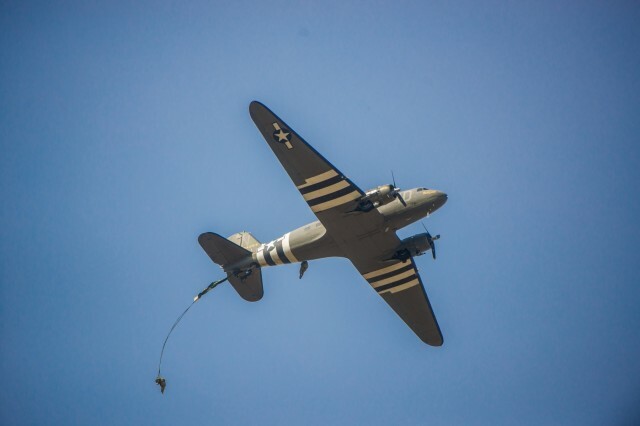 The Festival was held in close coordination with Fort Benning's 1st Battalion, 507th Parachute Infantry Regiment, which operates the U.S. Army Airborne School. "I'm getting down later in life, and this is something I enjoy," said 81-year-old Wayne E. Porter, of Fredonia, Kansas, a veteran of the 11th Airborne Division. He joined the Army in the 1956, served three-and-a-half years, and is now national secretary of the 11th Airborne Division Association. To Porter, events like the Festival stoke strong feelings of comradeship, patriotism, and fond memories of their military service. "The sacrifices that our brothers, friends, made -- it just makes chills run down your back," said Porter. "Every day I'm more thankful that when I got out of high school I joined the Army." One highlight of the first day, April 4, was a bus trip to Fort Benning's Fryar Drop Zone to watch a parachute jump from a vintage World War II-era C-47 Skytrain transport plane, a green, twin-engine aircraft with alternating black and white World War II "invasion stripes" on its rear fuselage and wings. 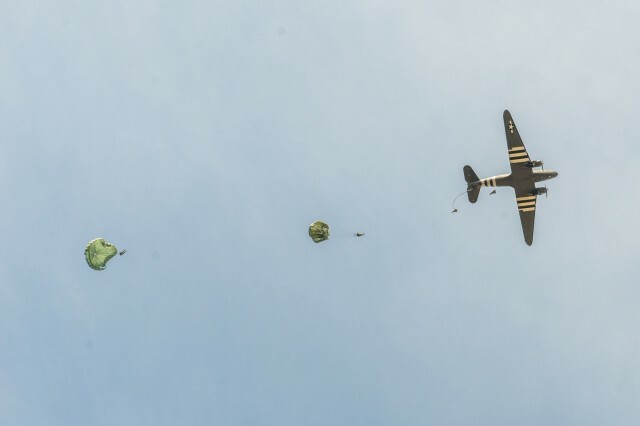 The jumpers, some dressed in World War II re-enactor's paratrooper uniforms, were members of the Liberty Jump Team, a civilian group made up of parachutists, most of them current or former military jumpers, and some not. Under bright, hazy skies, the visiting veterans as well as a group of students just a day from graduating from the Airborne School, waited in gray metal bleachers for the C-47 to arrive at the drop zone, a broad, open field of pale green grass streaked with patches of brown. Soon, the plane loomed into view and at 10:22 a.m., the first in a succession of jumpers sank into view below the plane, a small darkish figure tossing through the air until the green parachute spilled open and blossomed into a round canopy above him. More jumpers followed about a second apart until a line of 14 jumpers were strung across the sky behind the aircraft, descending soundlessly, and in an irregular line, to the ground. About a half hour later, the C-47 made a second drop, this time of 17 jumpers. Throughout the jump event, a Liberty Jump Team member stood not far from the bleachers and provided a running commentary on the jumps, as well as explanation of jump procedures, and the history of the U.S. Army Airborne, recounting especially its actions during World War II. 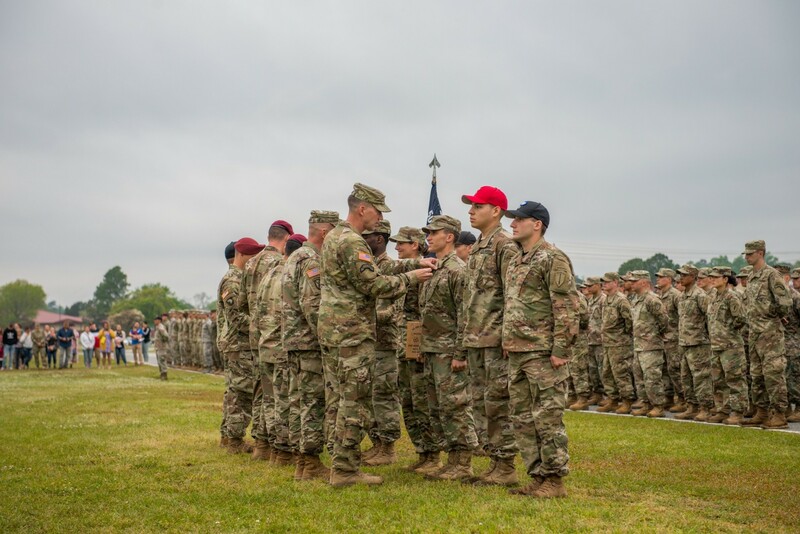 Events of the second day, April 5, began on Eubanks Field with the 9 a.m. graduation of 293 Airborne students of Charlie Company, Airborne Class 16-19, part of 1-507th PIR. The class was composed mostly of U.S. Army Soldiers, but included members of the Marines, Air Force and Navy, and one member each from the South Korean and Greek armies. For one of the visiting veterans, Michael K. Oesch, 69, of Anniston, Alabama, getting to see the newest paratroopers was especially satisfying. Oesch served 27 years in the Army and retired as a first sergeant. He is member of the Vulcan Chapter of the 82nd Airborne Division Association. "I like to talk to the troops," said Oesch. "You know, the troops are the people, they're gonna be the future of the Army. And I like to shake their hands and congratulate them. I make a point of doing it." The graduation was followed by a wreath-laying just a few yards away, at the Airborne Walk, an area of concrete walkways in the shape of paratrooper's wings, and an arrangement of 29 granite markers surmounted with bronze plaques commemorating Airborne units past and present. 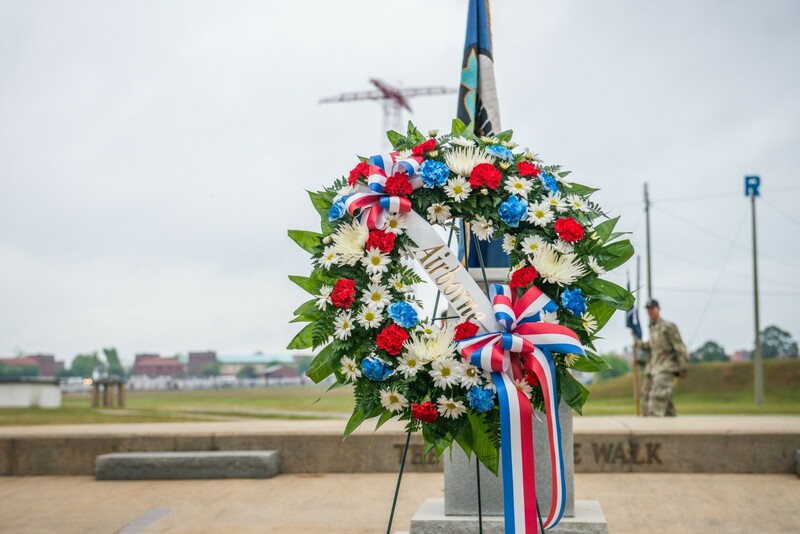 The ceremony's narrator told the audience that the Airborne Walk "is primarily dedicated to the individual Airborne Soldier, for it was through his individual leadership, toughness, aggressiveness and heroism that the name Airborne became and remains synonymous with military excellence." A green circular wreath adorned with red, white and blue flowers and a ribbon of those same colors was placed at the foot of one of the granite markers, in tribute to America's paratroopers. The marker's plaque commemorates America's first parachute test platoon, formed at Fort Benning in 1940. The laying of the wreath was followed by the playing of taps. In brief remarks at the wreath-laying, Lt. Col. Benjamin L. Morales, commanding officer of the 1-507th PIR, said "all paratroopers have a common bond. It's a bond that defies time, distance, and even death. Let us use this ceremony to remember all those who have served and those who are still serving today, in the Airborne community." The third day, April 6, closed with a banquet at a hotel near Fort Benning, at which the All-Airborne Association presented "Trooper of the Year" awards to several former paratroopers who had been nominated for recognition by their respective veterans associations. Also during the banquet, the audience of about 135 heard remarks by Maj. Gen. Gary M. Brito, Commanding General of the Maneuver Center of Excellence at Fort Benning. Besides being home of the Airborne and other schools, Fort Benning provides entry-level Soldier training, often called "basic training." 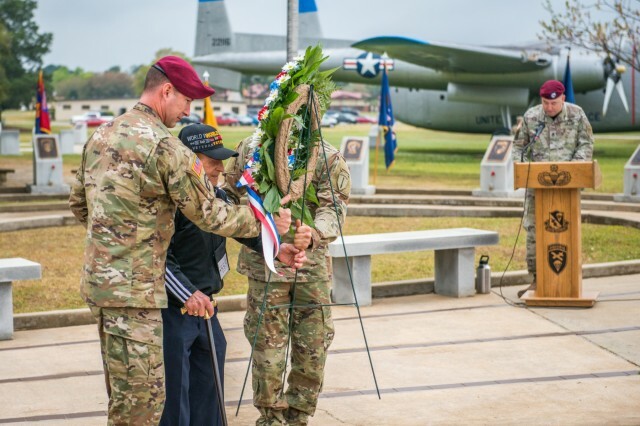 "When we think about the future of Airborne operations in combat," said Brito, "we must remember to look at the past 79 years and the brave men -- our Airborne veterans -- who jumped out of an airplane to ensure our freedom remained intact ... Thank you for your service. "It is your stories that we tell to our young Airborne students and basic trainees," said Brito, "to inspire courage and motivation as we forge them into Soldiers here at Fort Benning..."